Depending on where you live, some people will experience the Full Moon on March 1st or 2nd... so double check in your location! We are in the Earthy sign of Virgo. The Full Moon in Virgo can be a great ally to get you organized and help you grow your dreams in a realistic and obtainable way. Be careful with overwhelm and trying to do too much all at once... Virgo energy can help you get really focused or really picky which could delay your progress. Either way the energy can be very intense! Tonight, we will show you how to connect into your own dream seeds that you are planting and growing and use the Virgo energy to bring focus to them in a fun and creative way. We are making Dream Seed Satchels! Dream Seed Satchels are portable vision boards of your dreams and goals. Instead of pasting items to a big board, you can carry them with you, keep them on your altar, or someplace you will see them frequently, and you can even use the satchel as an inspirational oracle that you have created yourself! Let's begin! You can even add the Mini Moon Oracle Set! anything else you would like to add... use your imagination and intuition! Begin to clearly set your intentions and what you wish to focus on for the satchel. Is there a specific theme? Take your time to gather all your items and images and place them all out in front of you and your satchel. Feel free to cast a circle and ground yourself before you begin to put the satchel together. Feel your body growing roots into the Earth and the energy of Earth rising up into your body... Feel the Moon's energy cascade down your Crown chakra and let these two energies merge in your heart chakra. Feel this energy move through each arm and through you hands. You are now ready to create! You can begin however you wish, there is no particular order of things unless you have one in mind. As you place each item in your satchel state why you are putting it in or how you wish to work with this item. State it out loud so you put vibrations into your dream seeds! For the elemental offerings start with Air, then Fire, Water, and then Earth... this sequence builds the energy and momentum of your dream seeds. For the oil and water, you could literally place on drop of each in the satchel in case you are worried about them spilling. I am ready to Thrive! Place this satchel out under the Full Moon along with any other decks or crystals you wish to charge and cleanse. Now carry this satchel with you until your dream seeds bloom! Whenever you need extra inspiration to follow your dream seeds, place your hand in the satchel and take an item out. Let it be your oracle and lead you to your next action. You can do this for daily inspiration or whenever you need an extra push. More Ways to Tune to the Moon! 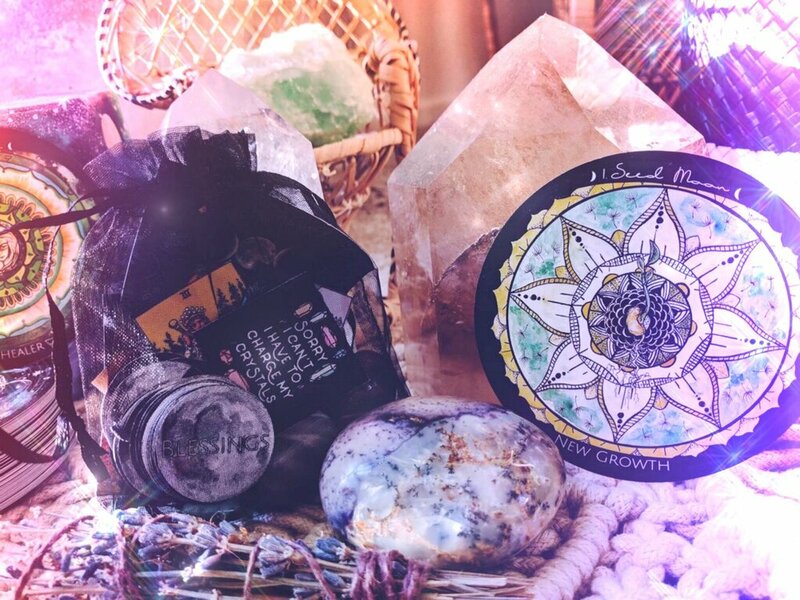 Subscribe and receive the Mini Moon Oracle Set! Sign up with your email address to receive news and updates about Spirit de la Lune! Happy Full Moon in Virgo! Equinox season is almost here, and the land begins to shift into balance once again. Depending on where you are on Gaia, we are moving from the extremes of hot and cold into the rejuvenating breezes of Autumn or Spring. This is a wonderful time to connect with the land and the Fae realm! The Fae, or Faeries, are the spirits of nature and the elements. In many of their myths and lore, their pure energies of the earth help bring the turning of the seasons, protect the flora and fauna, and keep the earth balanced. They are wild and are known to be tricksters to humans! But when approached with childlike wonder, respect, and sincerity, they can be wonderful allies to work with! This Full Seed Moon spend some time on the land connecting to Mother's Earth's energy, let her cleanse you and rejuvenate you for the new season ahead. 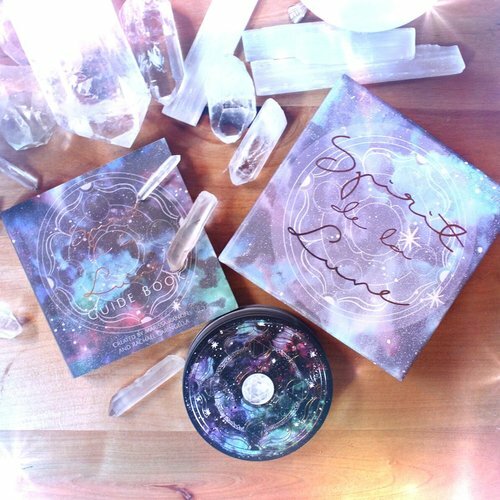 Connect with the Fae realm and you will add more magick to your Equinox whether you celebrate Ostara or Mabon! Ways to connect with the Fae! Go out into nature, whether it is a forest, beach, hiking trail, or park. Faeries are everywhere! But they especially love hidden places, so those who truly wish to make contact must take a quest. If you can be barefoot, even better! Making direct contact to the Earth is so healing and grounds our spirit to Gaia. Seek out your place to connect. Set an intention to meet a Faerie. Be barefoot, if you can. Before you begin your walk, feel Gaia's energy move through the bottoms of your feet, opening the chakras at the bottom of your soles. We have eyes at the bottom of our feet! Imagine these chakras opening like you are opening your eyes, and you will activate your primal spiritual body helping you to connect with the Fae more. Now begin to walk slowly and intentionally. Let the eyes of your feet see for you. They will guide you to the Fae. Listen to your body and enjoy your surroundings. Stay in the present moment and look for signs of the next season... (Spring: new life, blossoms, green! Autumn: changing colors from green to orange to red, falling leaves). Welcome the Fae into your own garden and home by creating a space for them! Creating a sacred space for them will show you are eager and wanting to make a connection. This is thoughtful and fun to create! You can place miniature furniture, or crystals, have fun and make it yours! It can be in a terrarium or planter inside your home, or outside in your actual garden space. Let your inner child create this and infuse it with your pure, playful energy! If you are planning to plant seeds, or pot plants, before you begin your project, place the seeds in the Faerie garden or surround the garden with your plants and ask the Fae to bless your plants and seeds. 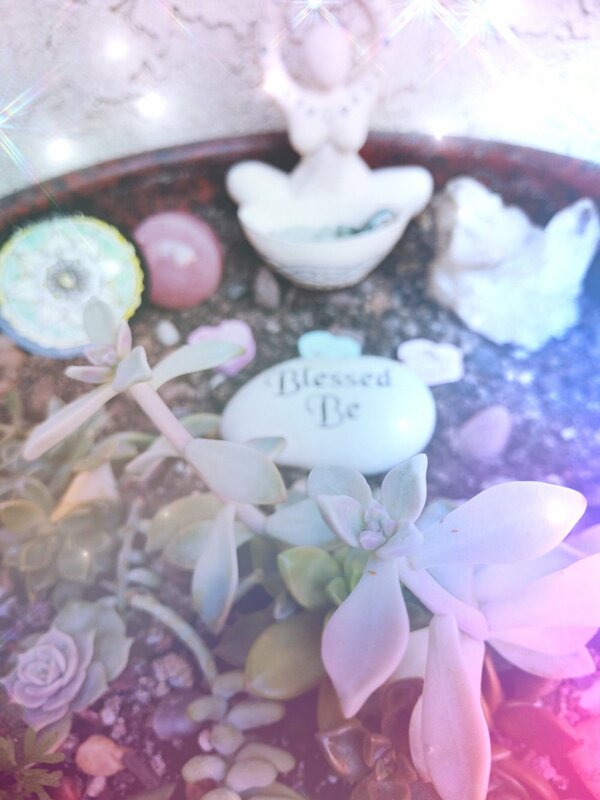 Make sure to place an offering bowl or plate in your Faerie garden and give them presents every New or Full Moon! It can be food, crystals, dried herbs, or you can light incense, pick some fresh flowers for them, ask them what they would like! I left green heart chakra crystals for them! If you read our previous post about Moon Signs, you know that a Virgo Moon is a wonderful moon to connect with the earthy Fae realm and sacred plants of Gaia! Virgo Full Moon water is potent to water to use in your garden and on your house plants! Create a batch of Moon Water for your Fae garden and plants and leave it out under the Full Moon tonight! You can add crystals like Moss Agate, Green Aventurine, and Prehnite for new growth, and plant care. Create as big of a batch as you need or want to have with or without crystals. The Virgo Healer energy of the Moon will still charge the water. The next morning water your plants and give thanks to the Fae for their magick and blessings! Not sure when to water your plants? Let the Moon Signs and Fae help you! Water your plants every New and Full Moon and when the Moon is in water signs (Cancer, Scorpio, and Pisces) and earth signs (Taurus, Virgo, and Capricorn)! Be sure to lay any other crystals out under the Full Moon! Also, place your oracle cards out under the Moon in your Fae garden and ask them to bless your readings! 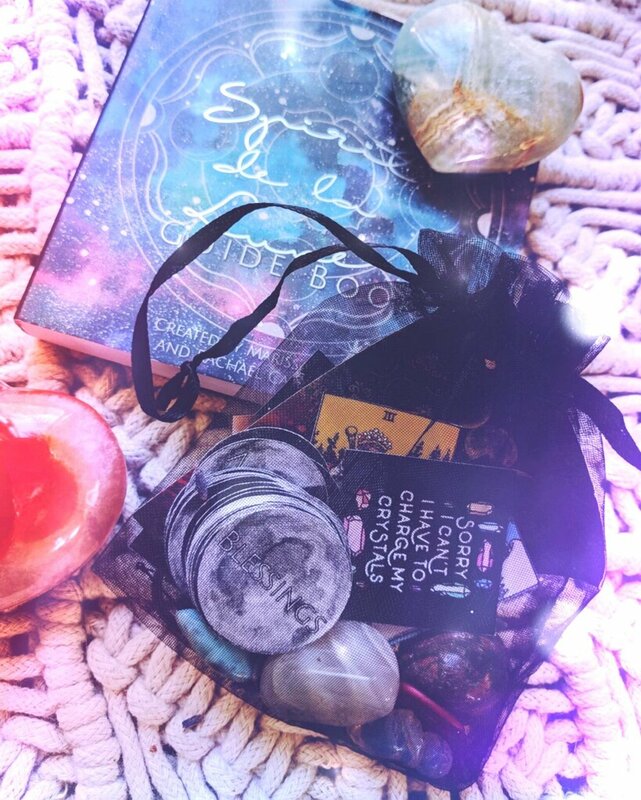 We are hosting an amazing Spring giveaway on Instagram with other magickal beings! Show us your Moon Sign selfie and you could win a free art print! FINALLY! We are excited to get these babies into our hands and out to the world again! We will always update our newsletter and instagram with deck updates, so be sure to follow! Sign up with your email address and be the first to know when our deck will be available again! We also send out monthly energy reports, and full moon ritual and ceremony ideas! Spring beckons forth with new life! We welcome in the Lunar Eclipse in Libra, a new season, a new chapter. The Seed Moon has reached her peak in the sky. It is time to set free your Dream seeds - any desires that have been brewing in your heart since Autumn and Winter. This ceremony will help you set your dreams and intentions free for the coming season and next chapter of your life. It invokes gratitude and love and spreads joy! Seeds are the container for new life, new growth, and the spark of vitality. In order for seeds to grow, they need be in an environment that nourishes their flowering and bloom. Before you begin this ceremony, meditate and journal about your personal environments: the physical environment where you live; your emotional container; the realm of your thoughts and dreams. Do they all support your soul for growth and thriving? What do you need to weed out in order to create the environment that supports your bloom? Become clear in this. Take responsibility for the environment that surrounds you and energy will begin to shift in the direction you want it to go. With your intentions are clear, gather your herbs and flowers and your dream seeds. You dream seeds are little offerings you will be sending out into the world infused with your intentions. They can be seeds of wildflowers local to your area, crystals you want to offer to nature, little bundles you create... whatever your dream seeds are, let them be safe for the environment, and let them be the container for your intentions. Infuse your items by holding your offerings close to your heart and imagine pouring your intention, love, and joy into the dream seeds... what color do you see? What kind of light is it? Once you have all your gear go out into nature, a park, ocean, a trail... and take your time to offer the herbs and flowers and seeds to the land. Sprinkle them here and there, bury some dream seeds, make a mandala, or even leave them out in the open so some other person may happen across them and make their day! When you spread out your offerings bless them, the land, and your intentions. You are offering your heart when you sprinkle each dream seed! You are keeping the flow of love, joy, and abundance moving! New growth! Thrive where you are rooted! If you have the Spirit de La Lune deck, do not for get to do the Seed Moon spread or the Lunar Eclipse spread in the guidebook! I literally drew the cards Lunar Eclipse and Seed Moon not intentionally! These cards are so intuned! 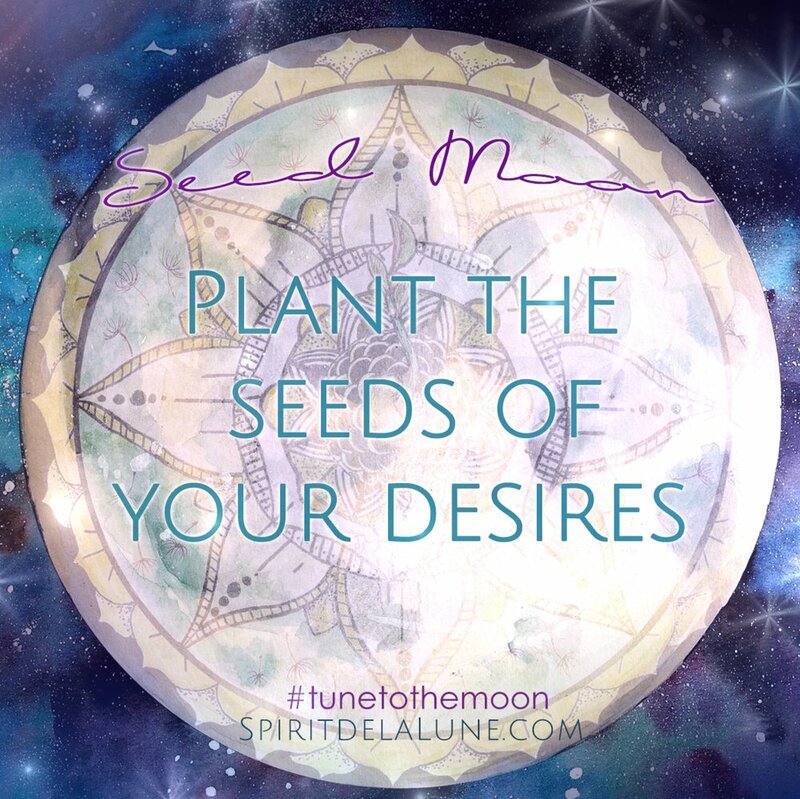 Be sure to use the hashtag #spiritdelalune so we can see your readings! Leave out you deck to charge under the Full Moon and Lunar Eclipse... this is a potent portal flowing through so infusing your deck, gems, and other sacred items would be wonderful!